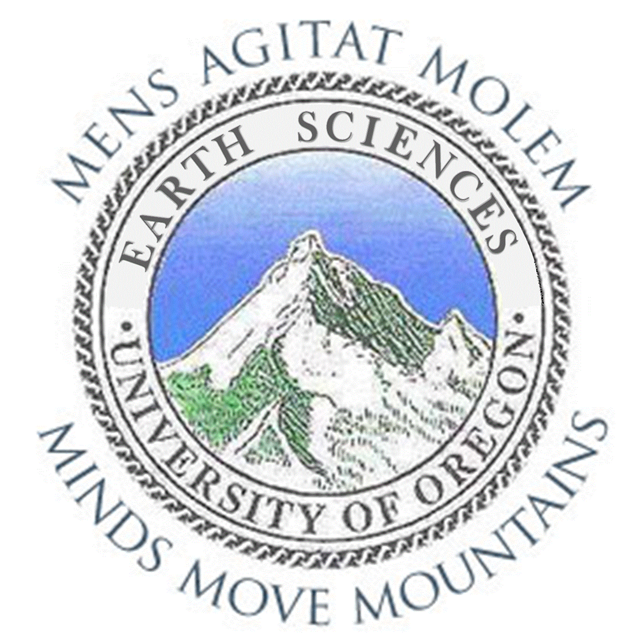 UO Geological Sciences Alumni Society: Reconnect and get involved! Alumni Update Form: We like to hear from our undergraduate and graduate alumni! Tell us what’s new in your life with this form. Dissertations and Theses: A listing of graduate dissertations and theses. Online documents available for those published since December 2007. Giving: Learn how you can support our mission of education, service, and scholarship. UO Alumni Association: Keep connected to the University. David Levering (BS, 2007) completed his MS in Zoology at Oklahoma State University in 2013. He is now the Director of Education at the FHSU Sternberg Museum of Natural History. In 2014 he established an earth and life science field camp program at the Sternberg Museum for junior high and high school-age students. Four programs were offered, focusing on paleontology and wildlife in Kansas. Since then, the program has grown to include junior high field camps in Kansas and Utah, collaborative high school field biology programs in New Mexico and Ecuador, and an annual field paleontology program that pulls in students from across the country. To date this field camp program has provided nearly $20,000 in scholarships to gifted low income students so they can attend. Most of this money has gone to recruiting rural students form low-resource communities. This program has also generated substantial income for the Museum, allowing us to hire staff, sponsor student interns, and improve our educational offerings in western Kansas and beyond. His advice: Be kind and patient. Be relentless in pursuit of your goals. Listen when others try to give you guidance. (Sometimes they will be wrong. That’s okay. So will you. Find a lesson in those miscues.) Compliment your friends and colleagues often. They probably need the encouragement. Learn to handle b**ls**t with grace and fortitude. Buy a coffee for a young person who is excited about the same things you are. Take time to chat with them. You’ll make their week, and I promise they’ll pay that kindness forward someday. And my degree from UO, and connections I have made with faculty and other students, have been invaluable in my career development. From collaboration to ongoing mentoring, I can’t say enough about how important my time at UO has turned out to be. Aside from my friends and classmates, I especially remember the truly excellent graduate teaching assistants I had for my lab sections. They formed a huge part of my education and growth while at the UO. I know I would not be who or where I am know without their patient guidance. Erin (Carroll) Hughes (BS, 2003) advanced her geologic studies by getting a M.Sc. in Hydrogeology at the University of New Mexico in 2006. Erin also put her Spanish minor from UO to use as part of her MS Thesis project in Nicaragua and several subsequent volunteer endeavors working on water projects in Latin America. Erin has worked as hydrogeologist at GSI Water Solutions, Inc. in Portland, Oregon since 2008. Her work focuses mostly on investigating and developing strategies for multi-stakeholder contaminated sediment, soil, and groundwater sites. She serves as a technical lead and project manager for remedial investigations of contaminated sediment and porewater being conducted at various sites, including River Mile 11 East of the Willamette River (within the Portland Harbor Superfund Site), a former landfill on the Tualatin River, and a former logyard/sawmill in Tacoma, Washington. Erin enjoys the multi-disciplinary nature of sediment remediation projects and finds her geologic education important when developing and refining conceptual site models. She also enjoys taking the large quantities of data that are generated by these projects and developing innovative presentation techniques to technical conclusions as well as strategies and solutions to regulatory and multi-disciplinary audiences. Her advice to current students? Take the time to get to know your peers and start networking with professors and professionals while you are still in school. Because as I’m finding, relationships are the key to a successful career and I only wish I would have slowed down and taken a few less credits per term as an undergrad so that I could have better come to know those around me. My favorite part of being a geology student was being able to participate in the Geologic Field Camp. Such a practical and interesting way to apply one’s education to real-world situations. Robert Coyle (BS, 1981) earned his Master of Business in Global Management in 2001 at the University of Phoenix, and is now the Chief Operations Officer at Cupric’s Canyon Capital. Robert and the Cupric team, through a local subsidiary, Khoemacau Copper Mining, LTD, is finishing feasibility work to put a world class underground copper mine into production in Botswana. His degree from the U of O Geology Department was the foundation upon which his whole career was based. He continues to have a strong love of all things geologic and uses the fundamental skills learned at Oregon every day. He remembers the great camaraderie among the undergraduate, graduate and faculty members, and it was an incredible experience to connect so well with like minded people and be made so welcome in the department. Tim Dawson (BS, 1994) earned his MS at San Diego State University and now works for the California Geological Survey. He was recently promoted to manager of CGS’s Alquist-Priolo Fault Zonation Program, which is responsible for mapping active faults in California and establishing Zones of Required Investigation in order to assess fault rupture hazard. His advice for current students? Find an aspect of geology you love and stick with it. My time at Oregon has resulted in some great career and travel opportunities and I made some close friends and colleagues that I still work with 20+ years after I graduated. Jessica Winders (Miller) (BA, 2012) is currently Assistant Residence Life Coordinator at the University of Oregon. After graduation she pursued an opportunity combining her passion for education and geology as a Field Instructor with the Outdoor School program through the Multnomah Education Service District. After working with students and in outdoor education and leadership, she decided to return to the University of Oregon to engage in furthering student learning. While working with University Housing, she was awarded the Oregon Women in Higher Education award of excellence for Exemplary Emerging Professional of 2014. She is now working on campus with the Lundquist College of Business and University Housing facilitating the largest single theme Academic Residential Community in the state, helping students navigate their experience at the University of Oregon. How has her degree impacted her life? I met my husband at the University of Oregon in my senior year. My degree has allowed me to explore my passions of the outdoors, education, science, and student development. She remembers being in the field, and in the lab. It was hard work but also some of the best times in my college career. And her advice to current students? Join Geology Club, and volunteer for different opportunities. You could end up getting some fantastic experiences and this is the best time for you to explore the field. Your first degree is your project of love. Find something you enjoy! Masters/PhDs are what you do when you know what you want to do. Anthony Sieber (BS, 2004) is a Geologist with Natural Resources Conservation Service. As the newest member of NRCS Geological Services Unit, based in Salt Lake City, he is currently working on watershed and dam remediation projects throughout Utah. Todd LaMaskin (PhD, 2009) completed his dissertation under the guidance of Professor Dorsey. After a brief time with the Wisconsin Geological and Natural History Survey, he joined the faculty at University of North Carolina Wilmington where he leads the Basin Analysis Research Group. Todd teaches undergraduate classes in historical geology and sedimentation-stratigraphy, and graduate classes in stratigraphy and basin analysis. His current research falls into two broad categories including the Mesozoic tectonics of western North America and calibration of geologic time. Derek Ryter (PhD, 2002) is a Physical Scientist with the USGS Oklahoma Water Science Center and is finishing publication of two groundwater-surface-water models in drought-impacted Oklahoma as USGS SIRs. His advice to current students? Enjoy it! Working on my Ph.D. out there was the best time of my life! And how has his degree from UO impacted his life? Now I always watch the Ducks 🙂 But seriously, I’m really proud of it because of the amazing faculty I worked with. Carl Swanson (BS, 2009) completed his MS in Geology at Central Washington University in 2012, where he studied how quantitative patterns of fluvial and glacial erosion change throughout areas of varying tectonics and climate. He is now a PhD student at Tulane University, where his research is focused on studying how fluvial network systems respond to tectonic perturbations and climate fluctuations. He also recently worked in the Washington Cascades studying the extent of alpine glaciations over the last million years. Sean Bemis (PhD, 2010) is an Assistant Professor at the University of Kentucky. After leaving Oregon, he spent 1.5 years as a Mendenhall Postdoctoral Fellow with the USGS in Menlo Park where he made use of the newly released airborne LiDAR data to work on evidence for Quaternary deformation in NW Oregon and SW Washington. In the fall of 2011, he began my current position as an assistant professor in the Department of Earth & Environmental Sciences, where he is currently expanding his research directions in Alaska, California, and Oregon exploring questions of earthquake recurrence, restraining bend evolution, and fault system evolution. John Galetzka (BS, 1995) spent 1996-2002 working for USGS as the Network Coordinator for the Southern California Integrated GPS Network, and 2002-2013 working for the Caltech Tectonics Observatory as an Associate Staff Geodesist and Field Engineer establishing GPS networks in Sumatra, Nepal, northern Chile/southern Peru, Tibet, Taiwan and Baja California. His advice to current students? Enjoy your chosen discipline to the fullest and when looking for a job, aim to serve your country and planet! And how has his degree from UO impacted his life? Very, very strongly. I owe much of the last 17 years of adventure and meaningful work at USGS and Caltech to UO DoGS! His strongest memories from UO are his fellow classmates and all the field classes. Rick Streiff (BS, 1977) is a Senior Geologist for a gold exploration program in New Zealand. Prior to his move south, Rick gained experience in 5+ underground mines in Nevada and Washington. Tim Dawson (BS, 1994) is working as an engineering geologist for the State of California. His current responsibilities are in the Geologic Mapping and School Site Review Programs for the state. On the side, Tim still practices his paleoseismic skills that he learned from Professor Ray Weldon. Mark Hemphill-Haley (PhD, 1999) is an associate professor of geology at Humboldt State University. He and his students study active deformation of the western United States, working at scales from from trench-scale paleoseismology, to individual faults and folds, to plate-scale deformation based on satellite-based geodesy. Diana Roman (PhD, 2004) was on the faculty at the University of South Florida from 2006 to 2011. She is now a staff scientist at the Carnegie Institution in Washington, D.C., where she studies the mechanics of magma movement through the crust, and the structure, evolution, and dynamics of volcanic conduit systems. TC Hales (PhD, 2006) completed his thesis under the guidance of Professor Roering. After a short time as a postdoc, he joined the faculty at Cardiff University in Wales where he teaches geology and does research on tectonic geomorphology, landscape evolution, rockfall erosion, and ecologic controls on landscape form. Heather Wright (PhD, 2006) received IAVCEI’s prestigious 2013 George Walker award, for early career scientists. She did a USGS Mendenhall postdoc studying Crater Lake volcanic deposits, and recently started a job with the USGS Volcano Disaster Assistance Program at the Cascades Volcano Observatory in Vancouver WA. Varina Zinno (Smith), (BS, 2007; MS, 2010, McGill University) now works as an exploration geologist for Alaska Earth Sciences, Inc., in Anchorage. She enjoys working in the consulting industry, which has provided access to a wide range of exciting work experiences throughout Canada, northwest US, and Alaska. Brandon Schmandt (PhD, 2011) is now an assistant professor at the University of New Mexico. He recently received AGU’s prestigious AGU Keiiti Aki Young Scientist Award in seismology. His research is focused on studies of North American lithosphere and underlying mantle, and evaluating the potential for seismic monitoring of rivers as a proxy for bed-load transport. Dan Rasmussen (BS, 2012) is pursuing a Masters degree at New Mexico Tech University, where he is studying the origins and evolution of Ross Island volcanoes in Antarctica. Dan is making good progress toward his MS degree and hopes to start research on a Ph.D. project next fall. Ned Molder (BS, 2013) is working for a startup company called GroundMetrics in San Diego, which does electromagnetic surveys for oil, gas, mining, and geothermal exploration. Ned likes his job and is excited to be out in the professional work force. Lisa Netzel (BS, 2013) is now working for Schlumberger as a field engineer on deep water oil rigs in the Gulf of Mexico. Offshore Mud Loggers are transported by helicopter to the rig and remain on site for 25 to 30 days working 12 hour shifts. Working for Schlumberger offers Lisa opportunities for a career in different aspects of the company including technical, maintenance, and management. Sammy Castonguay (BS, 2010; MS, 2013) is a visiting lecturer at the University of Wisconsin-Eau Claire, where he teaches Physical Geology (110) lectures and labs. He is enjoying the new culture of Wisconsin (they’re cheeseheads now! ), as well as the many opportunities and challenges of being an academic instructor. Please share your recent news! Use the Alumni Update Form.